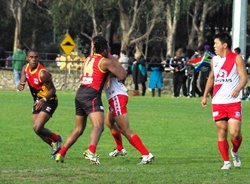 The final game for the day on Ransford oval put IC powerhouse the PNG Mosquitos up against the proud Japanese Samurai. Again – the chances of a close contest are slim but any followers of world footy know that the Samurai are nothing if not tenacious and will make even PNG earn their rewards. With the worst of the weather past – the sun poking through the trees and the chill breeze coming from the South-West and favouring the Brunswick end goals. Like a number of games today – it became clear from the start that one side was a class above the other. 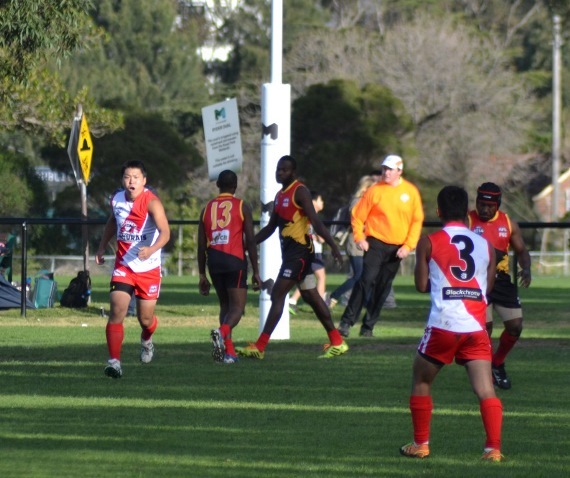 Even so, the Japanese defence battling against the breeze - forced PNG to work for the goals but with the class of the experienced Amua Pirika (#10) providing a potent target up forward the Mossies were soon able to get scoreboard reward. Five first quarter goals and the Samurai held scoreless but Sekiguchi (#9) and Nakamura (#1) were fighting the good fight up back with support from Sakaki (#12). The hopes of an early revival in the second term on the back of the breeze – the Mossies put paid to that with a mark and goal to Pirika within the first minute. Brendan Beno (#9) really came into the game in the 2nd term and PNG piled on another 6 but despite this the Samurai kept up the fight and were justly reward when a downfield free kick saw a relatively easy shot put through and the Samurai on the board with their first goal. By half time the margin was 73 and the game well and truly over as a scoreboard contest. Despite the margin the Samurai came out in the third term and continued to fight hard and often were forcing the Mossies onto the back foot and conceding ground back out of their forward zone. The key though was the ability for the Mossies to absorb the pressure and feed the ball back to a teammate in better position or to switch to advantage. Surer hands meant fewer turnovers. 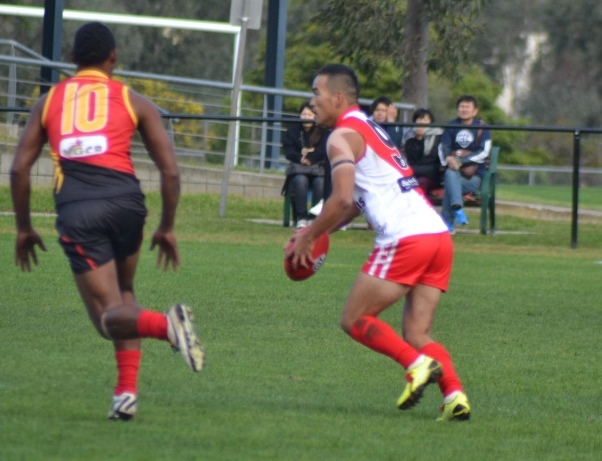 Surer hands included a mark of the day nomination from Paul Philip (#8) who took a specie near goal and kicked truly. PNG didn’t have it all their own way but even under pressure from Japan they managed 6 goals 7 for the quarter with a few low percentage shots attempted under pressure that perhaps against a classier opponent might be punished on the rebound. 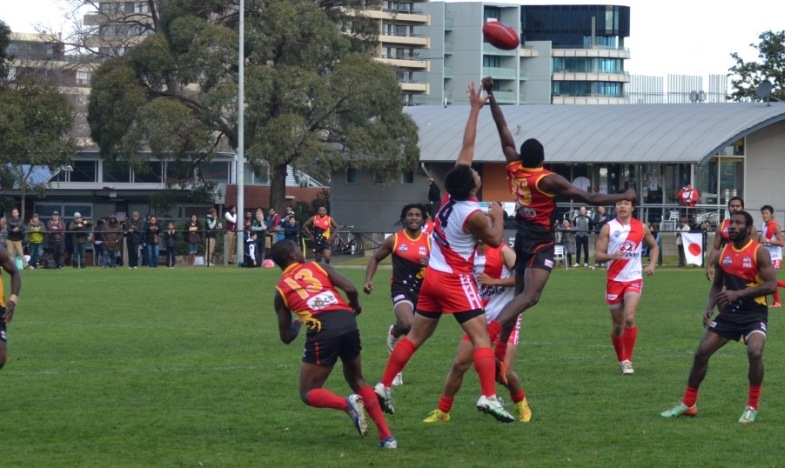 The last quarter saw a bit of ‘party time’ as PNG skipped right away – veteran Emmaus Wartovo (#12) capped off a solid game with a couple of last quarter goals including a nice volley out of the air. Pirika ended up with a neat half dozen and Beno with 4. 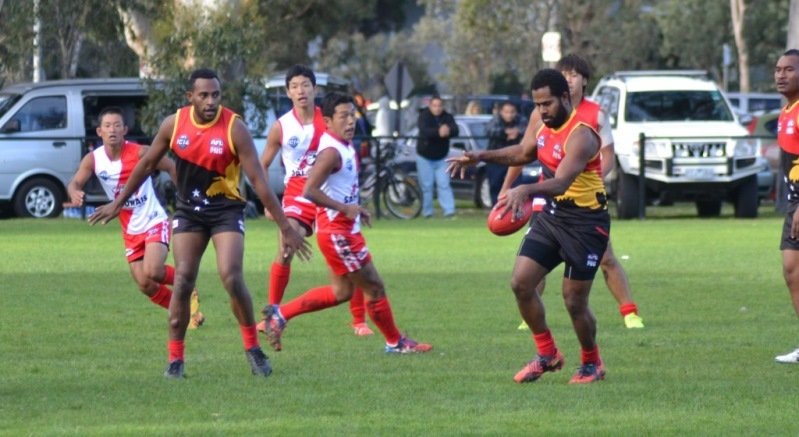 All in all a pretty even effort across the field – others to impress included jumping jack Philip and Jeffery Namete (#18) in the ruck and around the ground.